New to our Web Store, the SUBITO SU Precision Bore Gauge Range. 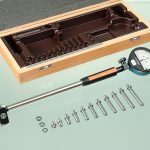 The SUBITO Precision Bore Gauge is an internal precision measuring instrument, based on a construction principle which is well established for over 80 years. The range of the SUBITO covers internal bore diameters from 4.5mm up to 800mm and also allows the operator to inspect deviations in forms within the bore. The Subito SU range is now on our web store.